Home » how to shop for a mattress » Please Lie Down on the Mattress! This weekend hundreds of mattress stores will be vying for your business. At Jordan Bedding it has always been my goal to educate consumers about how to find the best mattress for them no matter where they shop. Of course I prefer you buy from us, but at least if you listen to my tips for purchasing a mattress (accumulated after 30 years of experience) you might find your purchase more satisfactory in the long run. First of all, if there is one thing that is the most useless way to test a mattress that I see people do, it is just pushing on the mattress with their hands. I think it might be comparable to if you were shopping for a car and you just held the steering wheel. What would that tell you? Nothing. Yet many people walk around our store pushing on the mattress to decide what they like. Now granted, it may tell you how the ticking feels, or it might help you feel some differences in the top layer of foam, but it will tell you nothing about the support. So PLEASE- no matter where you shop go prepared to lie down all the way on the mattresses. Wear comfortable clothes, and don’t worry about putting your feet on our mattresses because that’s why we have foot protectors on the bottom of our beds. Secondly–don’t just choose a mattress by just sitting on it. Back to the car illustration–would you just buy a car based on sitting in the driver seat? Now I will give you more detail as to why the pushing or the sitting is not a good indicator of what you should buy. Mattresses today are designed to provide over all support and pressure relief. When a person lies down (and lies is correct here because I checked on a grammar site 🙂 on a mattress their body weight is distributed across the mattress differently than if they just sit on a mattress. Mattresses will give in different ways with the pressure points (heaviest parts) of the body while still providing support to keep the spine in alignment. This can be achieved with either the new types of innerspring mattresses on the market or with specialty foam mattresses or latex. Now is where it gets tricky. The best way for me to help customers is to have them try a few different styles of mattresses. For example if they tell me they like a firm mattress in general, I might have them try our Orthopedic mattress and then Duchess mattress and also the Serene memory foam mattress since they tend to be firmer. If they feel that is too firm, I would then direct them to our pocketed coil units or possibly a pillow top mattress. The thing is only the customer is going to know what feels good to their body. 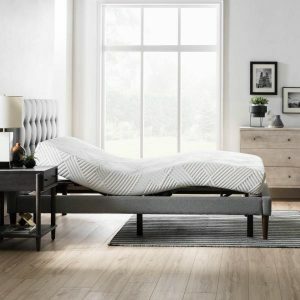 That’s why when customers ask me what is the best mattress, they are surprised when instead of just pointing them to the most expensive mattress I say, “the best mattress is what feels good to you.” Because at Jordan Bedding all of our mattresses are made to the highest quality. And if the mattress is for a couple–please try the mattress together. 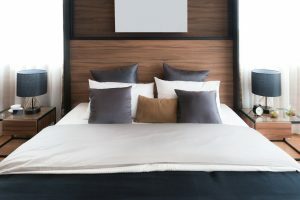 Sleeping with a partner will also have an impact on which mattress feels best. Certain mattresses contain support systems that cut down on motion when sleeping with a partner. Then after picking two to three mattresses you like I will encourage you to lie down on the choices for a minimum of five minutes each. I will even set a timer for you. I will ask you to lie in the position you sleep in most often, be it the side or back, etc. This may seem like a long time when you do it, but Consumer Reports actually recommends 10 minutes, which you are also welcome to do. When you lie on a bed for several minutes you will be able to feel how it is affecting your pressure points and joints. If you still feel good after that time then you can be pretty sure that it will work for you. Customers who listen to me and choose a mattress this way express more satisfaction with their mattress purchase. Now, some people are shy about lying down on a mattress in public, but trust me we are used to it and we encourage it. So as I recommended above–wear comfortable clothing and take off your shoes if you like or don’t–whatever works for you as long as you lie down on it. I know that in spite of this I am still going to have some pushers and sitters, but if that’s what you insist on doing to choose a mattress, just don’t be surprised if you are not thrilled with your mattress choice.